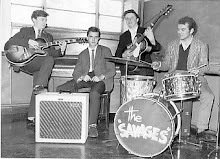 left to right: Terry King (Kings Agency), David Sutch, Brian Paul (road manager), Candy Calvert (13 year old broadcaster), Reg Calvert (Sutch's manager) with the Savages, dressed in animal skins and stone age gear - Pete Phillipps (drums), Geoff Mew (lead guitar), Colin Dale (disc jockey on Radio Sutch), Paul Dean and Ronnie Harwood (bass guitar). 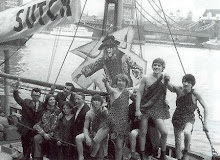 At the back is Screaming Lord Sutch pictured on a kite. Radio Sutch launched at the end of May 1964 from Shivering Sands anti-aircraft fort in the Thames - "Britain’s First Teenage Radio Station" on 194 metres (1542khz). 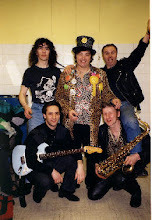 Brian Paul was the road manager of ‘Screaming’ Lord Sutch who used him for publicity. 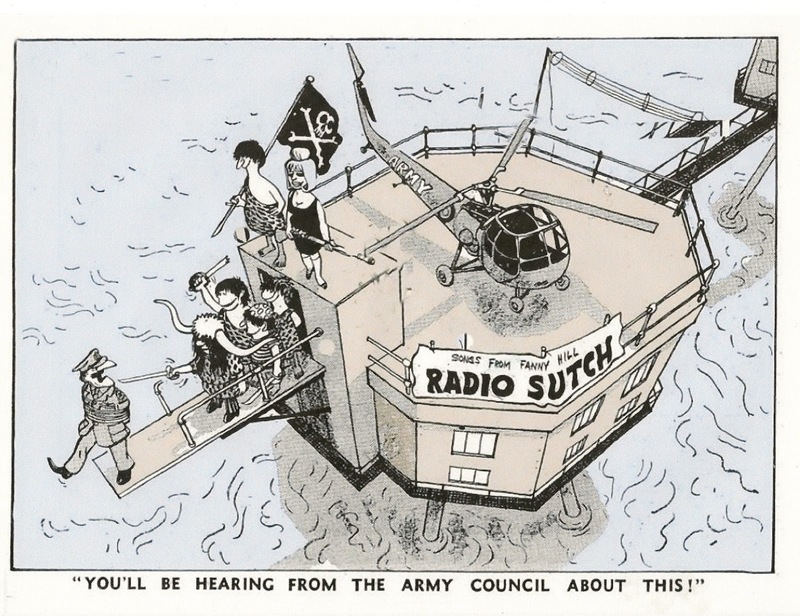 Sutch's manager, Reg Calvert took the idea of the launch a pirate radio station seriously. So Brian found himself roped into becoming a broadcaster. 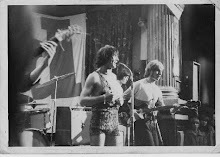 “Dave and my father sat in the car all evening - outside the Co-op Hall in Nuneaton on a Saturday night just after Radio Caroline first broadcast, planning how they could have a station. 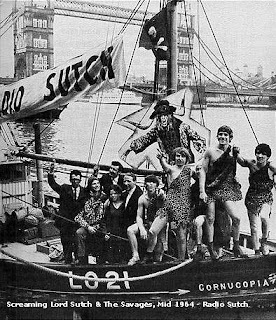 In late May 1964, along with the Savages, dressed in animal skins and stone-age gear, Sutch set sail from Leigh-On-Sea, Essex on board the Lowestoft registered fishing trawler The Cornucopia. Along with the motley crew, a large amount of equipment and supplies were taken aboard for later use in the station's new base. 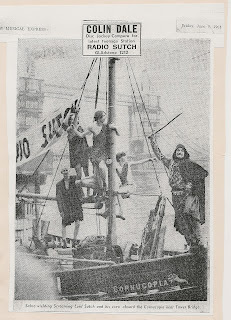 Sutch's party boarded the tower, and began transferring the supplies and equipment for the station from The Cornucopia. On the last trip in from broadcasting on the Cornocopia Sutch and his crew spotted the old wartime gun platforms at Shivering Sands. 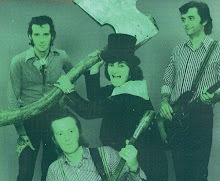 On 27th May 1964, Radio Sutch was back on the air with it's first track being Screaming Lord Sutch's very own Jack The Ripper. 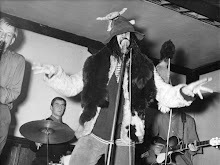 In September 1964, fed up with the bureaucratic side of running a pirate radio station (due to touring and recording commitments), Screaming Lord Sutch sold the station to his manager Reg Calvert who changed the name of the station to Radio City and installed new, and better equipment. A new more powerful transmitter was installed and over the months that followed the station gradually grew in power, in proficiency and in revenue. Unfortunately this big adventure ended with Reg Calvert’s death, 2 years later. It was a tragic loss not only for Reg's family and friends but also for the whole British music scene and entertainment. It signalled the beginning of the end for British offshore radio as the killing spurred the Government into legislative action. 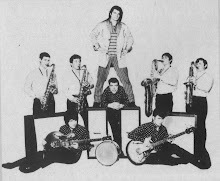 BBC Radio One started to broadcast in September 1967, using the disc-jockeys from the former pirate radios and playing pop music for the younger audience. I remember him very well. He used to come to stay at Clifton Hall with us. He was quite a character - and my father got on with him very well. They 'bounced' ideas off each other. My mother disliked David. She thought he was 'dirty' i.e. he didn't bath enough - and she disliked his greasy black hair that was tied back in a pony tail. Unusual for the times - as all the other singers had short well groomed hair. All the other singers and musicians used their own kitchen - which adjoined our kitchen, and knocked the door when they wanted to come into our 'family' kitchen. David however, had no respect for this, and would come and sit with us in our kitchen - much to my mother's disapproval. Dad did not mind - and we would talk about anything and everything. I remember my Dad and David planning the first political campaign - round the kitchen table. We thought it was a crazy idea! 18 year olds would never get the vote!! They really enjoyed the politics - and did it as a one-off publicity campaign for David - never expecting him to carry on with the Monster Raving Party. My father used to pay for most things - David rarely contributed to anything and I believe he didn't pay commission either for the bookings he had. After this we moved from Clifton Hall - and I didn't see David again. Your Havin a Larf - Aintcher ? 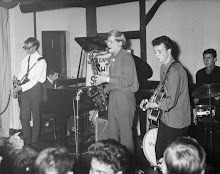 THE PICTURE AT THE TOP OF THIS PAGE ON THE CORNUCOPIA WITH DAVID SUTCH - SAVAGES - TERRY KING - REG CALVERT - CANDY CALVERT IS SLIGHTLY INCORRECT. 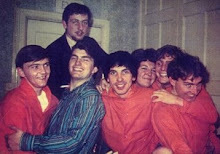 Between Geoff Mew and Paul Dean Nicholas, is myself Colin Dale - where you got the name John from is a mystery to me ?. Again not trying to be awkward ? 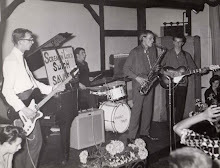 but Susan Calvert Moors account of the start of Radio Sutch is incorrect. I have sent you some photos and they give a far better picture of wot really happened. I hope you print them ? 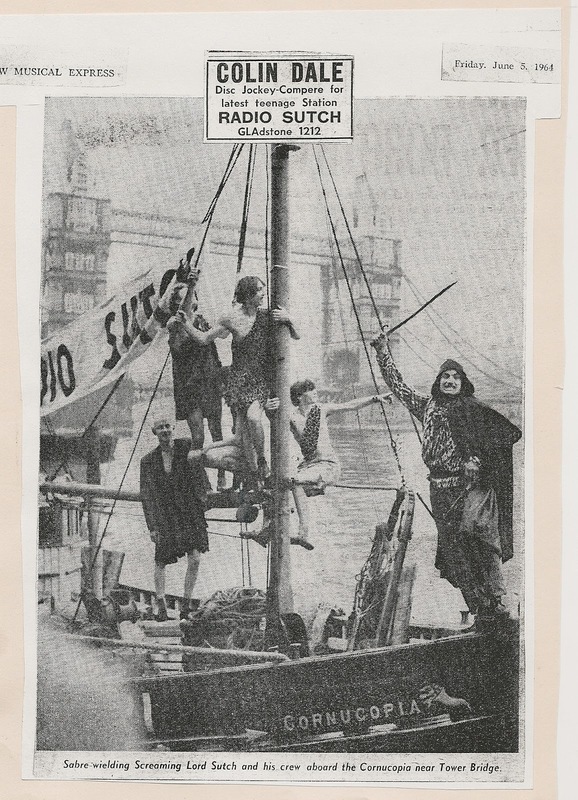 THANK YOU AT LAST THINGS ARE COMING TOGETHER - RADIO SUTCH WAS A VERY IMPORTANT PART OF MY LIFE. I like to see that the facts are correct, thank you. 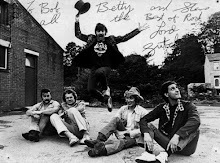 The guys I worked with were Geoff Pussey Mew - Tony Dangerfield - Brian Paull - Paul Dean Nicholas - John Gilbey - Tony Marsh - Pete Philips - Carlo Little - Reg Calvert - David Sutch - I knew Joe Meak when he was recording David Sutch and Tony Dangerfield. 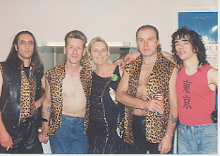 I also knew Terry King of Kings Agency, Denmark Street. Pete Newman is a friend of mine also Terry Clemson. HAPPY NEW YEAR 2014 - YES I'M STILL ALIVE.. Bet that's upset a few ? Colin Dale is a liar and fantasist. 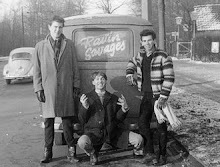 He was not a DJ on Radio Sutch, but in fact nothing more than a dogsbody for Dave Sutch and a roadie for the Savages for barely a few months. He now revels in made-up stories from this short period of time and weirdly seems to think this makes him some kind of 'celebrity'. I SEE ANOTHER GUTLESS WONDER HAS COME OUT OF THE WOODWORK ( there are still a few out there ) I ALWAYS PUT MY NAME TO ANYTHING I WRIGHT OR SAY, SO IF YOUR COMMENTS MAKE YOU FEEL GOOD MR/MRS ANONYMOUS ! THEN CARRY ON REGARDLESS..A week is a long time in politics ? AND 50 YEARS IN THE POP BUSINESS IS EVEN LONGER.. HAPPY NEW YEAR TO YOU AND YOURS..and may you get wot you wish for ! YOUR HAVIN A LARF - AINTCHER. I Totally agreed with everything you've written Anonymous, the man's a dreamer. The Problem with Modern Day Air Travel ? Is, one has to sit next to people who Fart, and smell of B O.. Your Havin a Larf ? Aintcher ? DECORATING THIS WEEKEND ? Let me pop round and fill your crack with Polyfilla !